He started nuzzling her the second he met her. Max spent the first part of his life as a racehorse. After he retired from that life, he somehow ended up in a “kill pen,” waiting to be slaughtered. 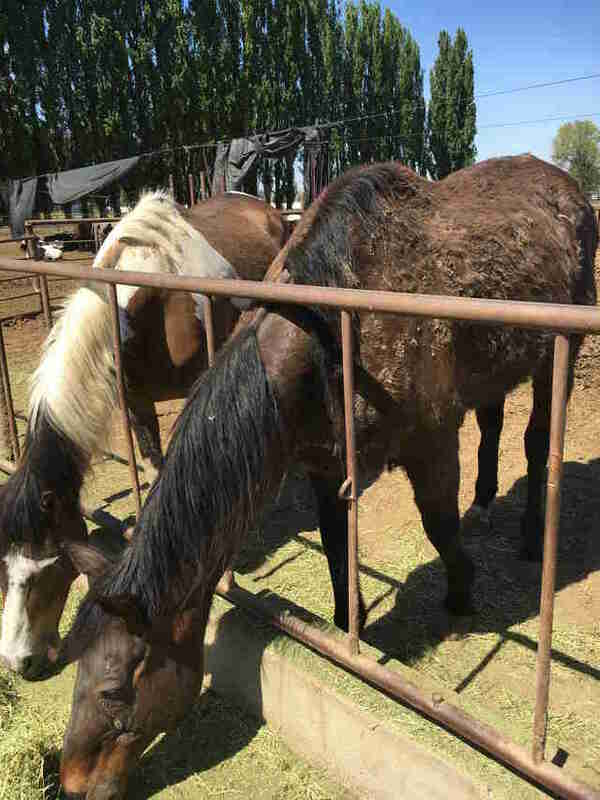 While he waited for this sad fate, rescuers from 3 Sisters Equine Refuge noticed him while they were there helping other horses — and just couldn’t forget about him. Max fit in incredibly well at the rescue from day one, and is the kind of horse who easily becomes best friends with everyone he meets — horses and humans alike. He loves being groomed and getting as much affection as possible, and simply loves being around anyone and everyone. Max got along with all of the horses at 3 Sisters Equine Refuge and never had one specific best friend — until he met a little orphan named Winnie the Poo. 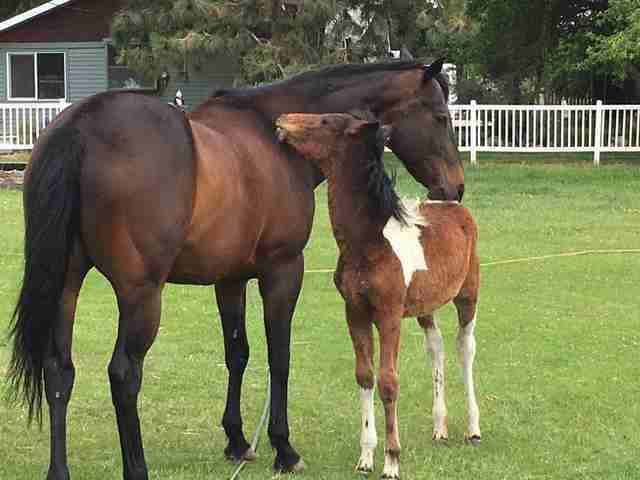 Poo was orphaned at only 2 months old, after a wild horse roundup sent her mother to be slaughtered. She had an infected mouth injury when she was rescued, along with a missing tooth and cuts on her face and legs. 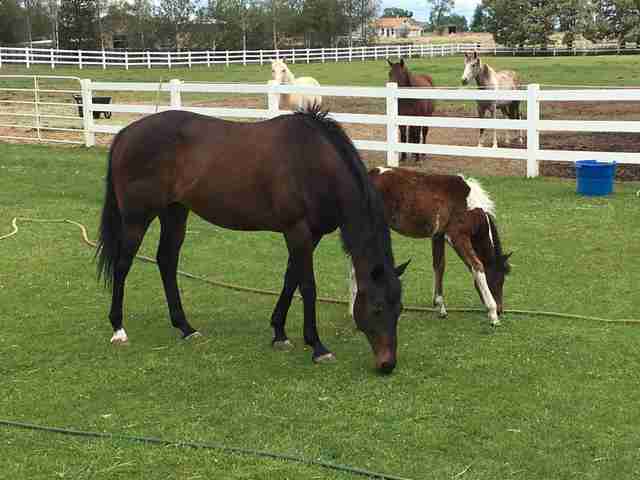 She was sent to 3 Sisters Equine Refuge because of her medical issues, with the financial help of the Wags and Menace Make a Difference Foundation. When Poo first arrived at the rescue, she was still very much a wild horse, and had a little trouble adjusting to life around so many people. Before long, though, she warmed up to her rescuers, and began to enjoy her new life. When orphaned baby horses arrive at the rescue, the staff likes to try and match them up with an older female horse who can provide a little extra attention and guidance, like an adoptive mother. Poo was introduced to several potential mother horses, but for some reason, the little horse didn’t bond with any of them. Still hoping to find a role model for Poo, the staff decided to try something a little different, and so they introduced Poo to Max. 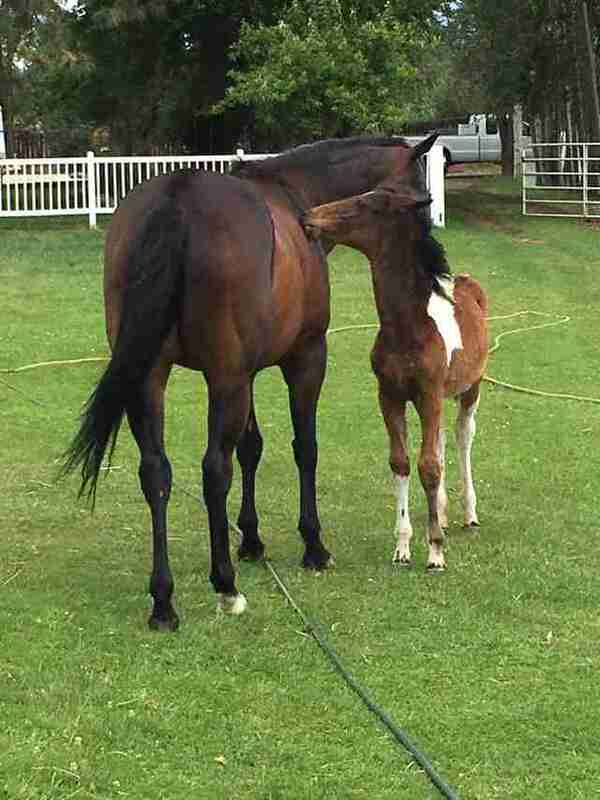 Even though Poo wasn’t able to bond with any of the female horses at the rescue, she took to Max immediately, and he became like her adoptive dad. The pair love to run around and nuzzle each other during the day, and absolutely hate being separated at night when it’s time to sleep. Max loves Poo just as much as she loves him, and keeps a watchful eye on her whenever they’re together. He takes his new role as her adoptive dad very seriously and is there for anything she needs. Both Max and Poo have been through a great deal of suffering, and now they’re able to take comfort in each other.